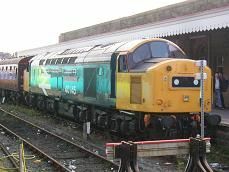 Traction: 40145 and 37 ??? The train had started at Birmingham International and I had picked up the train at Crewe. It then went onto Manchester Piccadilly before reversing and going back down the mainline to Stockport. It left the mainline at Edgeley Junction and then went southeast. The first station we passed through was Davenport where a few people were standing on the platform waiting to take photos of the train. We then passed Stockport Grammar School on the left where a game of rugby was taking place. Just a little further on is Woodsmoor station, which has just two basic shelters on its two platforms. We then pass more suburban housing, before passing a large hospital on the left and open parkland on the right. We then pass through Hazel Grove, where the original signal box is still standing. The station has been rebuilt in recent years. Then the Chinley branch then leaves us on the left and goes off to New Mills via the long Disley tunnel. Soon after freight line from Altrincham goes over us to join up with the Chinley line. The houses start to spread out now as we come out into the countryside and then enter a long cutting. We then slow down to about 40 mph as we pass through Middlewood station, which has a single shelter on each of its two platforms. We enter another cutting, as we pass under the Macclesfield canal. We are still going fairly slowly, but it turns out there is a speed restriction here, as we have go through four level crossings in quick succession. It starts to get more hilly here and it's also forested. Next up is Disley station, which is a pleasant station with brick shelters. We then go through the short Disley tunnel, (under the A6), before emerging with our first views of the Pennine Hills on our left. It's quite cloudy on the hills. We then pass through New Mills Newtown, which is a sparse station. The old station yard is full of empty lorries. We now see the Manchester to Sheffield line on our left running parallel to us in the valley below and also nearby, (but out of sight) is the Stockport to Sheffield line, which joins up with that one. There's also a canal full of narrow boats on our left. Next up is Furness Vale, which is a tiny station. Soon after crossing the A6 we come into Whaley Bridge station, which is a pleasant station with flowers in boxes. We start speeding up now, but only for a short while as we slow down again soon after. I spot an owl in a field below us as we start to climb up to Chapel-en-le-Frith. There are a few sheep in the fields on either side and you can see Mam Tor looming up on the left. We pass through some cuttings with combs reservoir on our left, before we pass through Chapel-en-le-Frith station. It is quite an isolated station, outside of the town and having just a single shelter. You can see the houses down in the valley below. We cross over the Peak Forest freight line and then go into Barmoor Clough Tunnel, which has loads of photographers at either end. We emerge into a deep cutting before arriving at the final station on this line, Dove Holes, which again is an isolated station, with just a few houses on the left and open moorland on the right. We then reach the top of Bibbington Summit and then enter another cutting, before speeding up as we go downhill into Buxton. Houses start appearing on both sides and we slow down as we pass Buxton signal box. There are two branches off to the left, which go to quarries, and then we pass the old diesel depot on the right, which is now sadly vandalised. We then come into Buxton station, which has two platforms with overgrown track in between. The original glass station frontage is still in place, though there is no longer a roof here.